It was £20 in a charity shop, I’ve never seen one for sale anywhere else! I’ve sewn clothes, quilts, curtains (for my brother so no pics), cushions, softies and baby clothes on it. I sew in fits and bursts, but this machine is definitely up to wear and tear! I love it because it’s the one I learnt to sew on. I’ll probably keep it forever, even once I upgrade. It’s very heavy but I like how sturdy it is. When it works it’s great but it does sometime throw a fit and I get angry with it, but normally discover it was user error later (like it needs or new needle or I’ve made a threading error). I love that it’s mechanical and one glance at all the dials tells me exactly how it’s set up. The manual is clear (although the trouble-shooting section is awful) and it just does the job well. It has lots of useful stitches, including an overlocker stitch. You can use a twin needle on it. The free arm is nice and skinny. There’s plenty of space under the throat for quilting (I have quilted a queen size quilt on it). It goes like a tank most of the time. Because it’s so old I find it hard to buy feet for it online, which is annoying. (Took me two tries to get a generic walking foot for it!) There’s no information about it online. None of these things are the machine’s fault – just the problems of using an older machine and not knowing my way around it perfectly. I’ve noticed this especially since getting my Brother 1034d, which has legions of tutorials dedicated to it! It’s not a great story, but I bought it in a charity shop beside the sea during a lovely day with my then-boyfriend, now-nearly-husband. I think he was a little skeptical that I’d use it (we lived in a teeny flat at the time so all space was premium) but sewing is now one of the great loves of my life. The first quilt I made on it gave me some much-needed distraction during a trying time in my life, and sewing is still the best therapy I’ve found. Update October 2013! 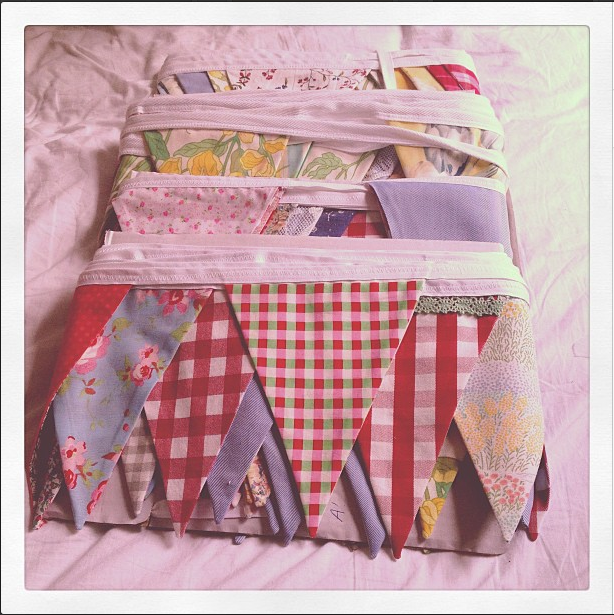 I made 50 metres of bunting on it for our wedding! Yes! It’s simple enough for a beginner to use (I love how all the threading up bits and pieces are on the outside of the machine housing so you can see what’s actually going on) and feels nice and indestructible. When I last had it serviced the staff were very complimentary about it. I do love a mechanical machine and so have my eye on the Bernina 1008, but realistically it’s more likely to be a Janome 525S (also mechanical but about a quarter of the price). I just really like turning dials to get settings rather than programming a computer – and because I’ve never had the needle up / needle down setting I don’t think I’d miss it! New Home 611 Manual PDF by email – $10 – but seriously! Don’t get this! Email me and I will photocopy my manual into a nice PDF for you! I just wanted to get this up as quickly as possible so haven’t done it yet but I can! If you are the owner of a New Home 611 Sewing Machine – I’d like to make this page as useful as possible for all of us so please comment with any tips or tricks you’ve found (or just to say hello) and come back to visit as I update this page with any new information I come across! Added 7 June 2013: I got a cheapie generic walking foot for my machine, and it works ok but pushed the needle out of centre when you sew. (The post I linked to below has an illustration of this). I was going to buy a new one BUT, with some google-fu I’ve managed to find the solution to this problem. It’s not elegant but it works. Update September 2013: I caved and got this cheapie generic walking foot instead, and it works like a dream! It’s only a pittance more expensive than the other one (£13.60! ), too. Nice review. I agree, there’s something about mechanical that will always make me prefer them to computerised (not that I’ve ever used computerised to compare!) Mine’s a Janome 525S, it’s great, I would def recommend it if you’re thinking about an upgrade. Thanks Sabs! That’s the machine I’ve got my eye on next…. Sounds like a great machine. I’ve never heard of that brand. I have a newer Brother and I keep having issues with it…it might be time for an upgrade. I keep thinking maybe I should get a trusty old one! New Home is what Janome used to be called before it was called Janome! I think I’m going to buy a Janome again next – but I’ll be going to a local dealer so I can try them out first. Great idea to post this for other users! I got a Brother sewing machine for my birthday but I have yet to break it out. I have a lot of sewing projects in mind just haven’t had the time yet! Ooh so exciting! You’re going to love it. I bought that Janome 525S at the end of January this year and have been finding it a joy to sew on. It was one of 2 Janome models recommended to me by a sewing machine repairman as being reliable, easy to use and sturdy. I have found it to be all of these things. My last cheapie Singer was getting a bit fussy so it was brilliant to sew with such an amenable machine! I also prefer the mechanical option as I feel electronic ones have more to go wrong. It sounds like you already have a great machine but if you do decide to get another, I would recommend the Janome. Hooray! So glad to hear that Janome is a great machine. As you say, I’m happy with mine for now but I like to research any big purchases way in advance so I don’t panic and buy something rubbish if mine ever breaks or if I get just too fed up with how heavy (and occasionally erratic) it is! Sounds like an excellent machine! I have a Brother, that I absolutely LOVE but I haven’t done any sewing in awhile. Thanks Ashley! Seems like the woodworking tools have been keeping you from that sewing machine, and that’s ok! Aww thanks Katie! Don’t be intimidated – I was for far too long but it’s not actually that complicated. If I can do it, you can! So sweet to add this to the web for anyone else looking for info! I do agree with your last comment (except you make much more advanced things than me). I bought my machine about a decade ago to make a quilt (while I was a senior in college), then I quit/graduated and didn’t touch my machine until a year ago. I still have those quilt pieces (I had most everything cut) and hope to get around to finish it someday! Thanks Crystal! I bet the quilt will be worth it when it’s done. to get the best quality machine for your price, I would suggest looking for a used Bernina or Viking sewing machine. Thanks for the suggestion Katherine! I will keep an eye out for those once a new machine gets to the top of the priority list! Hi Theresa, there is a slideshow in this post with a picture of every page of the manual. Eventually I will update it with a PDF! 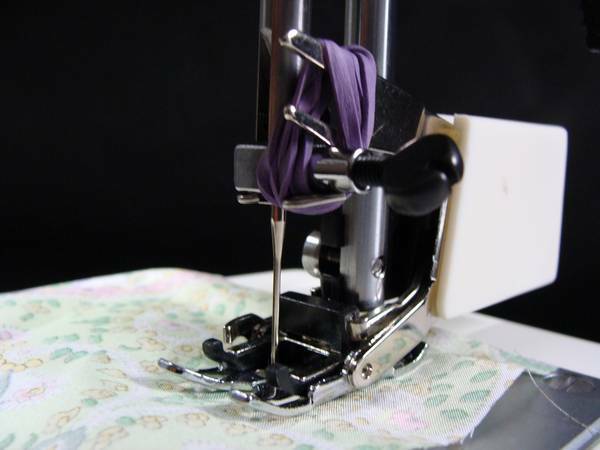 Hi Annabel, I have bought 2 of these machines (same model 611 with sightly different features – basically one has “chain stitch” and one doesn’t) and they have come with manuals. Hi David, that would be AMAZING! My email is Annabelvita@yahoo.co.uk. Thank you! Thank you for a very useful review. i am considering buying a New Home 611 – much prefer the old mechanical machines. However, the one I have my eye on doesn’t have a manual. Would it be possible to have a pdf? Hi Joan, I am happy to send you the PDF, what is your email address? Hi Annabel, I have the same problem……. inherited a Newhome 611 from mother in law, but without instruction manual or power cable. Would love to get it going… any chance you could forward PDFs to ritahyatt@ymail.com? Thanks very much! You should now have that! Hope it helps. Hi Lillian, I’m so sorry it’s taken me so long to get back to you! Please email annabelvita@yahoo.co.uk if you are still interested in getting a copy of the manual. I too have the 611 that I purchased at my local market for £5 about 6 years ago, it came with instruction book, case and loads of bits and bobs. It has been fantastic and has never let me down. Bobbin winder has decided to be temperamental, sometimes working like a dream and sometimes winding the cotton too lose. That’s annoying! I think you can buy little electric bobbin winders, which might help if it’s a real problem.